This resource features 12 posters, 12 student self-evaluations, and 48 writing prompts (4 per character trait). Character traits include: caring, citizenship, cooperation, courage, honesty, perseverance, respect, responsibility, self-control, self-motivation, tolerance, and trustworthy. Please download the preview file for a sample view of this resource. The preview file contains the full unit for the character trait of citizenship. Please ensure that it is appropriate for your grade level prior to purchasing. 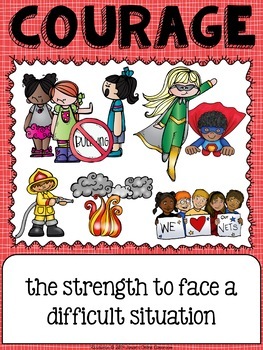 This packet features 12 posters illustrating and defining the 12 character traits chosen for this resource. 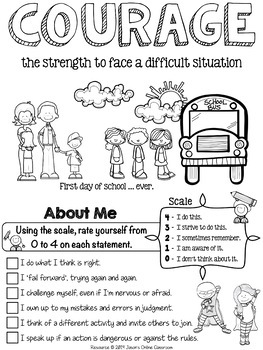 There is a self-evaluation for each character trait to encourage students to think about what behaviors demonstrate that particular trait and how their behavior rates according to the scale provided. The resource contains 48 themed writing prompts to get students thinking and writing about the experiences and issues that directly affect them. Each of the character traits included in this packet have writing prompts. The prompts cover the following categories: opinion writing, informative/explanatory writing, narrative writing and response to a quote. 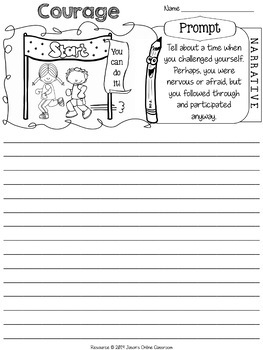 Students can use the back of their writing page if they need more room to complete their response. We really do care about each of our customers and we make sure we do everything in our power to provide you with quality resources. 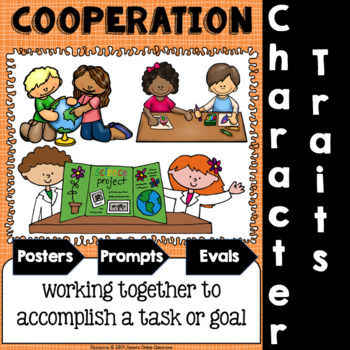 We hope you enjoy these character trait units.